Neighboring the new Round Rock Indoor Sports Center; minutes from Dell, Samsung, Emerson, and much more, the new Holiday Inn Austin North Round Rock is the place to stay for teams, corporate travel, and weddings. As one of the nation's fastest growing, best managed and safest cities, Round Rock tops the chart as both a business and leisure destination. For excellent service and modern perks, guests look to the Holiday Inn®Austin North - Round Rock hotel's facility. Whether staying in Round Rock to be near the outlet mall or businesses like Dell Headquarters, guests benefit from being 20 minutes from downtown Austin. While in Round Rock, you can stay near the Outlet Mall, Dell Diamond, and Old Settlers Park; so there's something for everyone. Shop at Round Rock Premium Outlets, and spend the afternoon fishing or sunbathing at Lake Travis. With downtown Austin just down I-35, the Texas State Capitol, museums and unique restaurants are a great day trip. We want you to enjoy your stay and encourage you to stay active and relax with a 24-hour Fitness Center, an indoor pool and a whirlpool. Enjoy your favorite dishes at the Red Rock Cafe and enjoy Happy Hour in the bar. We look forward to welcoming you! The doors to the Round Rock Sports Center are now open. The 82,800 square foot sports center features 6 basketball courts, 12 volleyball courts, and 9 multi-purpose rooms. 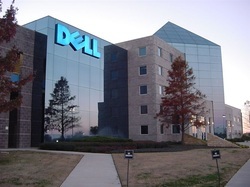 Round Rock, TX is home to Dell's headquarters. Only minutes away from The Holiday Inn Round Rock.